Johns Hopkins Kimmel Cancer Center researchers demonstrated that mice with ovarian cancer that received drugs to reactivate dormant genes along with other drugs that activate the immune system had a greater reduction of tumor burden and significantly longer survival than those that received any of the drugs alone. The study has already spurred a clinical trial in ovarian cancer patients. The investigators, led by graduate student Meredith Stone, Ph.D.; postdoctoral fellow Kate Chiappinelli, Ph.D.; and senior author Cynthia Zahnow, Ph.D., believe it could lead to a new way to attack ovarian cancer by strengthening the body’s natural immune response against these tumors. It was published in the Dec. 4, 2017, issue of the Proceedings of the National Academy of Sciences. Ovarian cancer is currently the leading cause of death from gynecological malignancies in the United States. “We’ve taken two types of therapies that aren’t very effective in ovarian cancer and put them together to make them better at revving up the immune system and attacking the tumor,” says Zahnow, associate professor of oncology at the Johns Hopkins Kimmel Cancer Center. Zahnow says that a class of immunotherapy drugs known as checkpoint inhibitors, currently being studied at the Bloomberg~Kimmel Institute for Cancer Immunotherapy, helps the immune system recognize cancers and fight them off. The drugs have shown success in treating melanoma, nonsmall cell lung cancer and renal cell cancers, but they have had only modest effects on ovarian cancer. Similarly, another class of drugs known as epigenetic therapies has been used to treat some types of cancer by turning on genes that have been silenced— either by the presence of chemical tags, known as methyl groups, or by being wound too tightly around protein spools, known as histones—but these drugs haven’t been effective against ovarian cancer either. Zahnow and her colleagues became inspired to investigate a new way to treat ovarian cancer by two recent publications from their group that showed epigenetic drugs turn on immune signaling in ovarian, breast and colon cancer cells (Li et al., Oncotarget 2014). These immune genes are activated when epigenetic therapy turns on segments of ancient retroviruses that activate type 1 interferon signaling in the cells (Chiappinelli et al., Cell 2015). Stone, Chiappinelli and Zahnow wanted to know if this increase in immune signaling could lead to the recruitment of tumor killing immune cells to the cancer. Zahnow and her colleagues worked with a mouse model of the disease in which mouse ovarian cancer cells are injected into the animals’ abdomens to mimic human disease. These cells eventually develop into hundreds of small tumors, which cause fluid to collect within the abdomen, a condition known as ascites. Floating in this fluid is a milieu of both cancer and immune cells, offering a convenient way to keep tabs on both the tumor and the animals’ immune response. The researchers started by pretreating the ovarian cancer cells outside of the animal in a culture dish with a DNA methyltransferase inhibitor (a drug that knocks methyl groups from DNA) called 5-azacytidine (AZA). After injecting these cells into mice, the researchers found that animals receiving the pretreated cells had significantly decreased ascites or tumor burden and significantly more cancer-fighting immune cells in the ascites fluid compared to those injected with untreated cells. These cells also had increased activity in a variety of genes related to immune response. Pretreating these cells with histone deacetylase inhibitors (HDACis), which help DNA uncoil from histones, didn’t affect the animals’ ascites or boost their immune response. 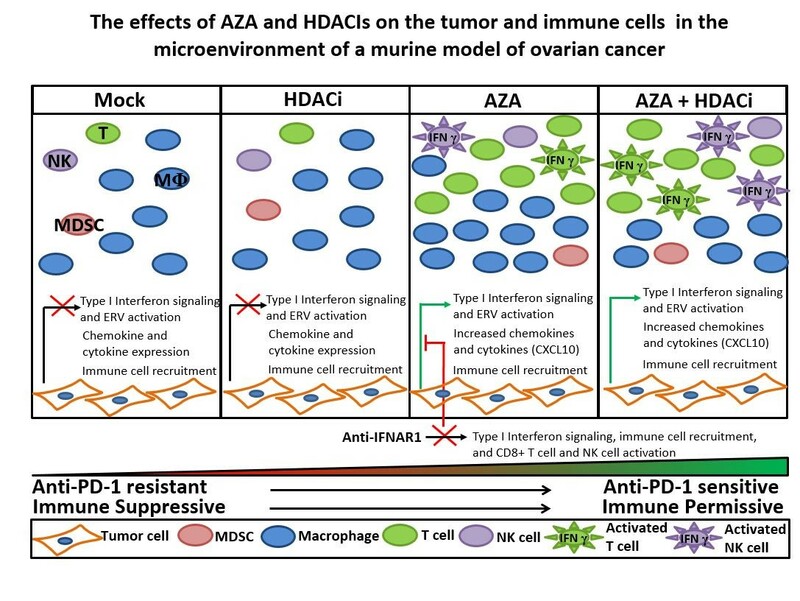 These early findings suggested that changes in gene activity induced by AZA cause the tumor cells themselves to summon immune cells to their location. In addition, when the researchers transplanted untreated cells into mice and treated the animals with both AZA and an HDACi, significantly more immune cells were in the ascites fluid, suggesting that the HDACi was acting on the animals’ immune systems. These mice also had decreased ascites, lower tumor burden and longer survival than mice that received just AZA. When the researchers treated the mice with both AZA and an HDACi, along with an immune checkpoint inhibitor, they got the greatest response—the highest decreases in ascites and tumor burden, and the longest survival. Further experiments using immunocompromised mice showed that the immune system is pivotal to the action of these drugs, rather than the drugs themselves acting directly to kill tumor cells. “We think that AZA and the HDACis are bringing the soldiers, or immune cells, to the battle. But the checkpoint inhibitor is giving them the weapons to fight,” says Zahnow, who also collaborated with epigenetics scientist Stephen Baylin, M.D., on this project. The preclinical data generated through this study is already being used to help patients with ovarian cancer through an ongoing clinical trial to test the effectiveness of combining AZA and a checkpoint inhibitor. Future trials may add an HDACi to determine if it affects outcomes. “Combining epigenetic therapy and a checkpoint blocker leads to the greatest reduction in tumor burden and increase in survival in our mouse model and may hold the greatest promise for our patients,” says Zahnow. In addition to Zahnow, Stone, Chiappinelli and Baylin, other participants include Huili Li, Lauren M. Murphy, Meghan E. Travers, Michael J. Topper, Dimitrios Mathios, Michael Lim, Ie-Ming Shih, Tian-Li Wang Chien-Fu Hung of Johns Hopkins; Vipul Bhargava, Karla R. Weihagen, Glenn Cowley, and Kurtis E. Bachman of Janssen Research & Development; and Reiner Strick and Pamela L. Strissel of University-Clinic Erlangen. The research was supported by grants from the Defense Health Program, through the Department of Defense Ovarian Cancer Research Program, under Teal Innovator Award OC130454/W81XWH-14-1-0385; the National Cancer Institute under Awards F32CA183214 and K99CA204592 and Award P30CA006973; Janssen; the Samuel Waxman Cancer Research Foundation Collaboration for a Cure Grant; Irving Hansen Fund; and Dr. Miriam and Sheldon G. Adelson Medical Research Foundation.